The Fortress in Arezzo is one of the most interesting places to visit while you are in Arezzo. Its restauration is underway, the exterior cladding is complete, the interior works are in progress and excavations in archeological site have unearthed the remains of San Donato’s church in Cremona, dating back to the year 1000. Let’s have a short look at its history. In ancient times the Citadel was situated in the present area of the Fortress: it was called “Poggio di San Donato” and was defended by a surrounding wall inside which there were the City Hall, houses, towers and several churches including San Donato. During XIV Century, when Arezzo ends up under Firenze domain, the residents give life to numerous revolts and both the defensive structure and the “Cassero”, suffering much damages, need reconstruction. In 1502 Arezzo is definitively fell under Firenze and a new insurrection determines a drastic choice from the dominants of Firenze. Cosimo I orders the building of the Medici Fortress, a new structure which needs to be really inexpugnable. The job is committed to a renowned architect, Giuliano del Sangallo, who conceives the structure by virtue of the new technological and military evolution. During its realization, all the buildings present in a wide range are cut down, especially to free space for the artillery fire and the majority of the buildings like the City Hall, Tarlati’s palace and other religious areas disappear, such as San Martino’s church, which had to find near the current City Hall, and the San Matteo’s church mentioned by Vasari. The fortress remained efficient until 1782. 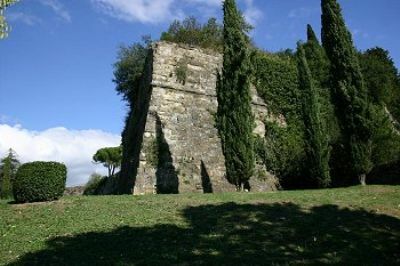 In 1800, Napoleon’s soldiers to punish Arezzo’s rebels, raided for days the city and tried to dismantle the military district: destroyed all buildings within the fortress, including San Donato’s church, then attempted to damage even the surrounding wall using mine. Fossombroni’s family acquired the fortress in the middle of 1800. In 1893, for testament of Count Enrico, it became a Municipality’s possession. It was adapted like garden for the public with various works carried out in the period 1896-1904. Inside one of the bastions was found a 14th century fortress door, adorned by an enormous statue of San Michele Arcangelo, now preserved in the city’s museum. It’s possible to do a guided tour to the rediscovery of the Medici’s Fortress in Arezzo, every Sunday morning at 10.30. The tour lasts about 1 hour and the price of the ticket is Euro 5 per person ( free for children up to 6 years). For all the details and bookings contact info@eurocasa.com or +390575845348.